Let’s not pretend that I have information you don’t. I’m not an expert. I’m one mom like many. Most days I am with ragged hair trying, pushing on to the next thing. And it’s not always easy. Many times I want to pull my disheveled hair out because the task of feeding children feels so overwhelmingly complicated and impossible. It seems I am not alone, so let’s talk about it. I don’t even know where to begin but to share my stories here with you and listen to yours. -Never forcing them to eat anything, I respect and appreciate their varied and sometimes delicate tastes. -Cooking lots of new foods, and cooking them properly, like never over cooking vegetables. -Cooking and having available foods that I know they will like. -Asking my children how they feel after they eat a certain thing. This must be genuine though and never turn into “I told you so.” When they feel sick. -Adding healthy high fats into their favorites (like spaghetti) I add non-virgin coconut oil as it has no taste and is the highest in saturated fats, around 90%. I also add egg yolks into soups and sauces and whatever else I can. -Involving them in the food process like harvesting and butchering (if they want to, and they always want to). -Having open discussions about food. -Being open to them helping with cooking. I know it’s messy and a little dangerous but they will be ok. They will learn to respect the stove. They will also be less likely to drag over a chair when mom isn’t looking and test the food. To eat when someone is constantly judging how you eat. It may even give them a stomach ache if we put so much energy into it. We are becoming much more connected to our food sources. We visit the farms and know the farmers. When you have been on the farm it makes the food that much more special and desirable. For the most part I have been able to relax and trust them to eat what they need and when. It keeps getting better too. I’m actually shocked by how much they ask for homemade soups and how they dislike foods lacking nutrition and real tastes. My oldest three have a definite understanding of the connection between what they put in their body and how it functions. We ask each other “what are you making your body out of?”. I’ve made mine out of a lot if soup, beet kvass, eggs and raw carrots. I have noticed that the older three will not overdo foods that are processed and sugary. I have given the freedom to eat them when we come in contact with them and I’m awed by their preferences for real foods. I’m still trying to find balance with the second youngest as he will eat and eat candy, processed foods. Once he gets a taste for it, he doesn’t want to stop and that has been challenging. I don’t have any rules I use but I try to talk to him and I notice it’s getting better. I have had many “no more freaking candy.” Moments and it’s felt stressful and I’ve felt powerless. I’ve also left it avoided situations when the food is really bad. But what else can I do? As long as they are in the world they are going to be exposed to things that I don’t agree with and that I deem harmful. I have to focus on the positive and keep adding that in. I keep adding in good foods, finding new and appealing ways to eat them. Our group of friends has grown into people that only have good foods to contribute and that’s so amazing. For me it’s been, having choice and guidance. It that an oxymoron? Thinking outside the cereal box helps too. 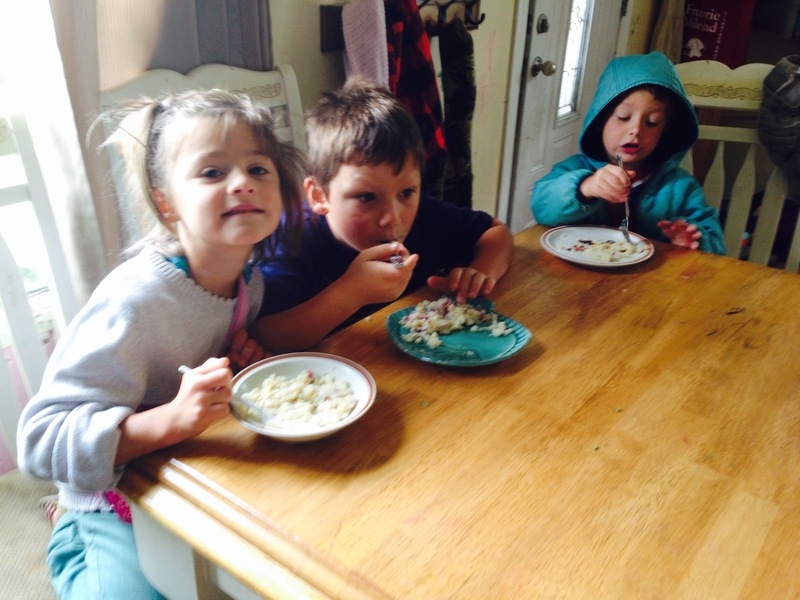 Here they are eating mashed potatoes for breakfast loaded with coconut oil and grass-fed butter.